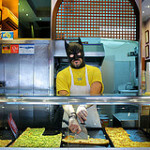 169/365 – “I’m Batman” nr.19, a photo by Luca Rossini on Flickr. Nineteenth day of the “I’m Batman” theme, the busy metropolitan life usually reflects into quick meals to be eaten up while on the run. Yet, here in the city quick meals can still be tasty thanks to the Bat-Pizza by the slice. 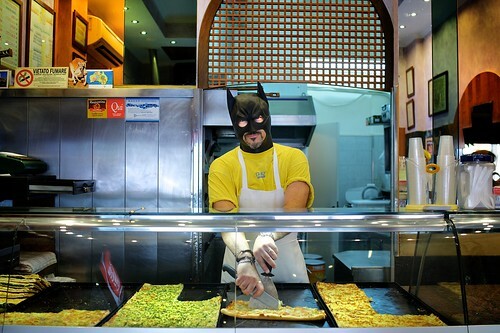 The Bat-Pizza-Maker is a master in serving fast and clean, at the same time ensuring that no foes will ever bother the customers enjoying the Bat-Meal.